Civic engagement encompasses a wide range of activities in which individuals work to strengthen their communities, to realize common goods, to enhance the capacities and dispositions necessary for democratic self-rule, and in general to deliberately shape their common life. Wesleyan University prides itself on enrolling and nurturing students with strong social consciousness. Students participate in a wide variety of formal and informal “civic” activities in Middletown and around the world. These activities include volunteer work, practica, activism, and service-learning courses. 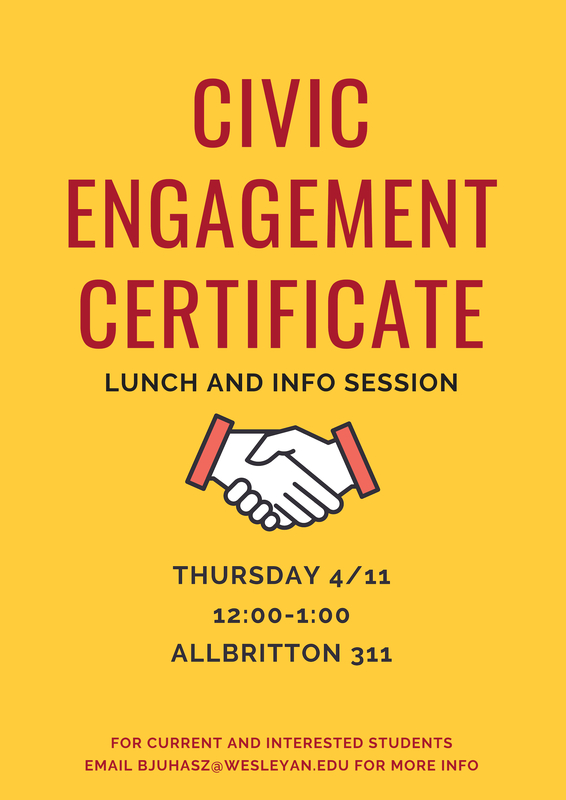 The Civic Engagement Certificate is designed for students interested in reflecting upon these activities and integrating their civic and academic efforts. Read up on alumni who received the Certificate. Join current CEC students at a Lunch and CEC Info Session. Learn more about the certificate and catch up with students in a diversity of majors, interests, and career paths.